You’ve probably been spending a great deal of cash on customer retention tactics. Building customer and brand loyalty is no easy task, but is equally as rewarding. You’ve probably been sending one email after the next because email marketing is king. But unless you’ve incorporated real hold-in-your-hand business thank you cards, you’re not doing everything that you can. The good news is this marketing tactic is easy, inexpensive and doesn’t have to take forever to set up and get going. Sending personal greeting cards shows a more personal attention to your recipients than yet another email sent to the masses. There are a number of occasions where sending business greetings cards is a must, but if we just take a closer look at business thank you cards alone we can pin point five opportunities there alone that are not to be missed. Depending on the type of business you run, manage or market (or all three) these opportunities will vary in importance. There may even be more to add to the list — have any? Make sure to let us know in the comments. 1. Post meeting follow up. Whether it’s a business associate or a potential customer — when someone took the time to meet with you about your business it’s a good idea to thank them. A simple gesture like this can solidify whatever it was you had met about and may be the little push that gets you the deal or lands you the job. Personal business thank you cards are so much more than just meaningless words. They help to create and foster a personal relationship that is necessary for building and marketing a business. You want your meeting to be memorable? 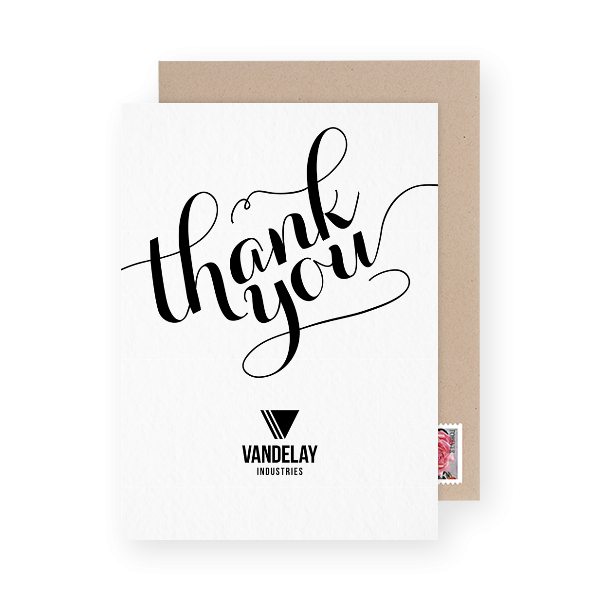 Send a personal business thank you card with your logo or branding on it — it’ll be hard to forget. If an old customer or a business associate sends a new client your way it’s time for you to send your thanks. Show your appreciation for the nod with a personal greeting. It doesn’t have to be long or elaborate, but make it sincere. You’ll likely be benefitting from this interaction and it’s all thanks to someone you know. Show your appreciation and perhaps this won’t be the last such referral. When a customer has stuck around long enough to have an anniversary, they deserve a personal and thoughtful thank you note. Show them that you care about their business and build customer loyalty at the same time. Something along the lines of ‘Thanks for sticking around with us for this long’ is a good starting point. You may want to gift your loyal customers with a little gift code, but a thank alone is also always going to be appreciated. 4. A job well done for deserving employees. 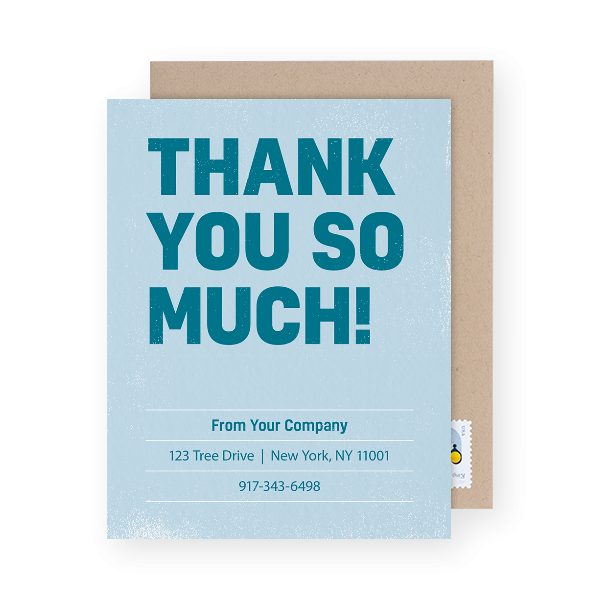 Send thank you notes to your employees. Birthdays aren’t the only time you should be mailing your employees cards. If someone has done an exceptional job — make sure they know that you appreciate their hard work and the results. Happy employees, happy business. 5. After someone has made a purchase. The messaging you include on the inside of your business thank you card is almost as important as sending the card in the first place. Avoid trying to sell anything or blatantly marketing anything. Including a quick note with a discount code is totally fine, but avoid having that as the focal point of your note. Think about your company ‘voice’ — this is all part of your branding. Use the same tone and wording you would in any other copy used in association with your brand (on your site, marketing, social media etc.). 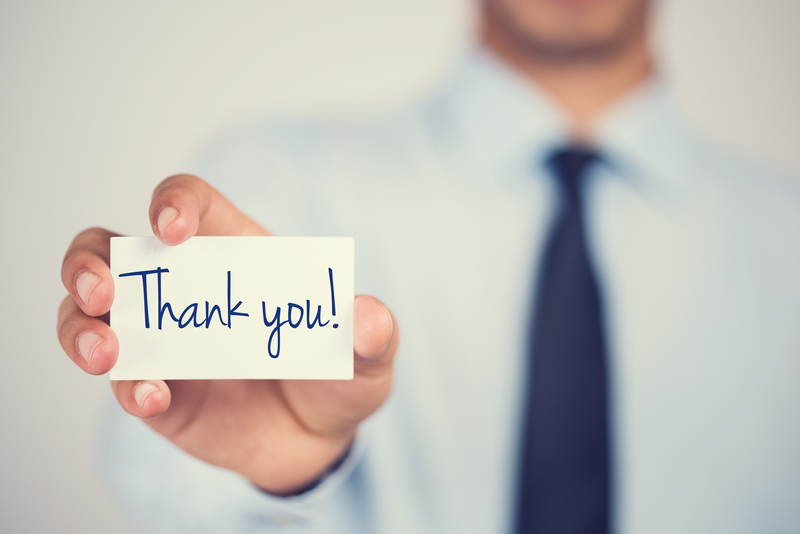 If your copy tends to be quirky and light hearted — keep your thank you message similar in tone. Keep it personal. Using the recipient’s first name in the salutation is a must. 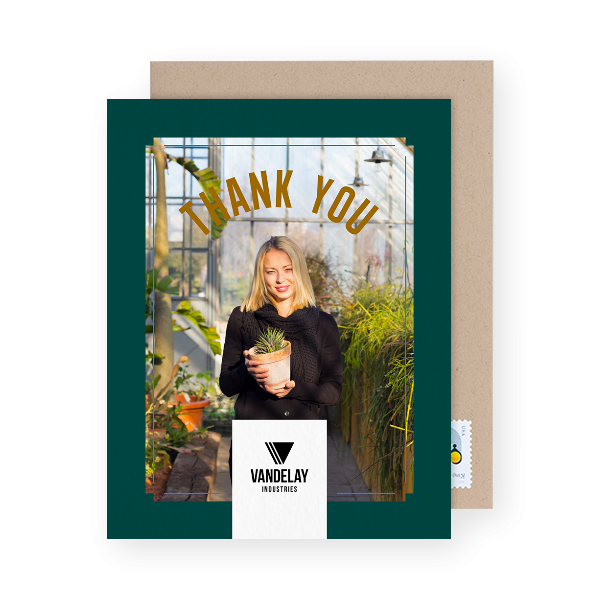 If you’re sending a bunch of thank you cards at once (200 cards to your most recent purchases for example) then this may be as personal you’ll want to keep it. However if you’re sending a business thank you note for a meeting follow up or for a referral — add details. Mention a few of the talking points from the meeting or mention the referral’s name so that your recipient is reminded of their good deed. Keep it short and sweet. You’re not writing a letter home here — keep your messaging short, sweet and to the point. You don’t want your recipient to get lost in the words and put the card down before they even get to the signature. Keep in mind that greeting cards don’t have as much space as a plain letter and for good reason. No need to write a novel — simply let them know you’re grateful and for what. BOOM. If you’re worried about adding yet another task to your ever growing to do list, this one doesn’t have to take up much of your time or attention. Postable will print, address and mail your cards out for you. Sending business greeting cards is literally as easy (well, almost) as sending an email. Once you set up your account, you’ll be able to customize business template cards with your company’s logo and information or choose from hundreds of designs by Postable’s incredible artists. Easily import a spreadsheet of your contacts so that Postable can address all the cards for you. Use the carbon copy tool to quickly apply the same message to many cards at once (with easy name customization) and click send. Like we said, this customer retention tactic doesn’t have to take forever to set up. You’ll be able to go back into your account and send one-off thank yous whenever you need or easily create another mass mailing without starting all over. Don’t have an account? Sign up in seconds for free here. 20 Questions with Christina from Forage Paper Co.